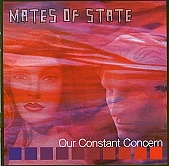 Flushed out pop songs prepared in a very indie rock fashion, Mates of State's Our Constant Concern is a quirky, engaging, and quite intriguing record, as the duo blends male and female vocals to create a sonic treat of soaring vocals and edgy harmonies. This isn't the Beach Boys or The Beatles by any stretch of the imagination; the harmonies Mates of State creates are ones you have to listen to a few times before you fully understand them. And that is the beauty of the band. They write indie rock songs in the pop vein, pushing the envelope on the indie rock, but staying true to its raw, emotional roots. I'll give this an A-.